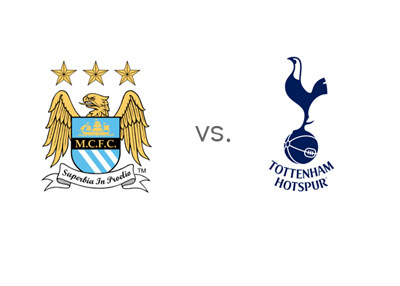 Eight place Manchester City are hosts to seventh place Tottenham Hotspur in the twelfth round of the English Premier League on Sunday, November 24th, 2013 at the Etihiad Stadium. The kick-off is at 1:30pm. Manchester City have scored 28 goals so far this season, more than any other EPL team. Twenty of those goals came from five matches they played at home. Manchester City are looking to continue their awesome form at the Etihad Stadium where they are undefeated so far this season in the Premier League. In their last match, away to Sunderland, they lost 0-1. Tottenham have only let in six goals so far this season in the EPL. They are not scoring very many (9), but they are getting away with it by being tight defensively. The Spurs are hoping to bounce back from a 0-1 home defeat to Newcastle, a game in which they played very well. City will be without their playmaker, David Silva, who is on the injury list, along with Vincent Kompany and Stevan Jovetic. The Spurs are also without their playmaker, Christian Eriksen, as well as the left back, Danny Rose, and the winger, Nacer Chadli. The hosts are the big favourites to win. A 100 € bet on Man City could return 70 € in profit, while the same bet on Tottenham could return 450 € in profit. The most likely score, according to the odds, is a 1-0 victory for City. Sergio Aguero, who is on fire lately for his club and the Argentina national team, is the favourite to score at 20/21, followed by Alvaro Negredo at 6/4 and Edin Dzeko at 7/4. Jermain Defoe is the favourite to score for the Spurs at 12/5, followed by Roberto Soldado at 13/5. So we have the most lethal attack in the Premier League vs. one of the league's tightest defenses. Will Tottenham be able to survive the onslaught of Sergio Aguero & Co?